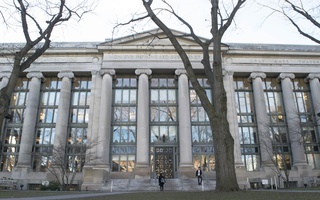 A black Harvard College student was arrested Friday night after a physical confrontation with law enforcement for charges including indecent exposure, disorderly conduct, assault, and resisting arrest, according to information posted Saturday by the Cambridge Police Department. In response to the event, the Harvard Black Law Students Association posted a tweet calling the arrest of the student an incident of police brutality. BLSA also later posted a statement on its website calling CPD's version of events—published on social media—"incorrect." 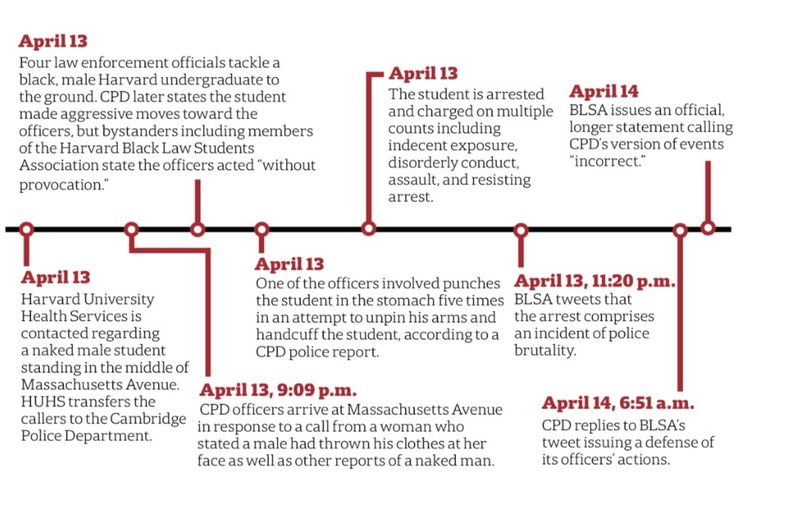 Members of BLSA, who wrote they videotaped the incident, wrote in the statement they saw the student, naked and unarmed, surrounded by at least three Cambridge Police Department officers. In a statement sent to Cambridge City Councilors following the arrest, Cambridge Police Commissioner Branville G. Bard, Jr. described the arrest and specifically discussed the five punches the CPD officer delivered to the student's stomach. 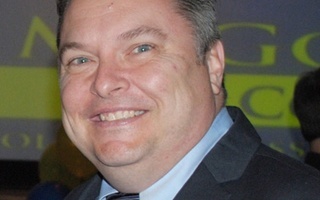 Bard wrote he had received questions and concerns from "select members of the community" and that "the primary concern" centered on these punches. "In a rapidly-evolving situation, as this was, the officers primary objective is to neutralize an incident to ensure the safety of the involved party(ies), officers, and members of the public," Bard wrote. "To prevent the altercation from extending and leading to further injuries, particularly since the location of the engagement was next to a busy street with oncoming traffic, the officers utilized their discretion and struck the individual in the mid-section to gain his compliance and place him in handcuffs." The statement notes the April 13 incident has "broader political implications" for students and for Bostonians. The statement explicitly states, though, that BLSA is not "contextualizing this event in the broader instances of police violence" out of respect for the privacy of the victim and his family "at this time." "Because the police department carries an affirmative burden to demonstrate that the exercise of force was necessary and appropriate, the department must conduct a complete and thorough review of all such incidents," the department's 2011 policy reads. Cambridge City Manager Louis A. DePasquale wrote in a statement to City Councillors over the weekend that he believes the outcome of the review will allow CPD to learn "lessons" from the arrest. "I await the outcome of the internal review and analysis of this incident by the Professional Standards Unit," DePasquale wrote. 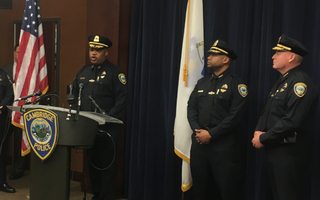 "I have great faith in Commissioner Bard and the men and women of Cambridge Police Department and I am confident that they will use this as an opportunity to reflect on lessons that can be learned from this incident." "I know that the Cambridge Police Department takes great pride in serving and protecting the City of Cambridge," DePasquale wrote. Roland S. Davis, the College's associate dean for diversity and inclusion, addressed the incident in an email he sent to College students Saturday afternoon. "Please know that our primary concern is for the student's well-being and privacy, and that we will be working with them and their family to attend to these needs," Davis said. "However, we are very much aware of the wider societal backdrop in which this has happened, and want to acknowledge that this incident may be upsetting to many of you." 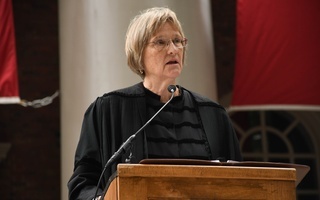 University spokesperson Rachael Dane wrote in an emailed statement that the University is "aware of the forcible arrest of a Harvard student by the Cambridge police department last night." "We are concerned and gathering information about the facts and circumstances leading up to the arrest and understand that the city of Cambridge is reviewing the situation," she wrote. "University officials are also working, as they always do, to care for and support our students." 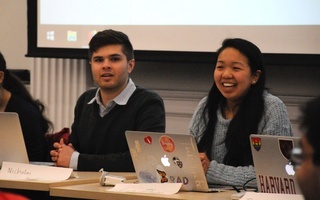 A previous version of this story indicated Harvard Black Law Students Association had released a public statement in response to the Cambridge Police Department's lengthy explanatory tweet and quoted some erroneous information contained in that statement. In fact, the document originally referenced in this story was a draft letter being circulated internally by BLSA; the draft contained some incorrect information regarding CPD's videotaping policies. CPD does not, in fact, have a policy requiring its officers to wear body cameras. After BLSA released its official statement Saturday evening, Crimson editors updated this article with the final statement. Editor’s Note: A previous version of this article embedded tweets from the Cambridge Police Department, the Black Law Students Association, and Harvard Extension School student Ernest Owens, who tweeted out an internal draft of a BLSA letter responding to the incident. The Crimson has decided to remove the embedded tweets from the article out of concern for the privacy of the student involved. —Staff writer Michael E. Xie can be reached at michael.xie@thecrimson.com. Follow him on Twitter@MichaelEXie1.